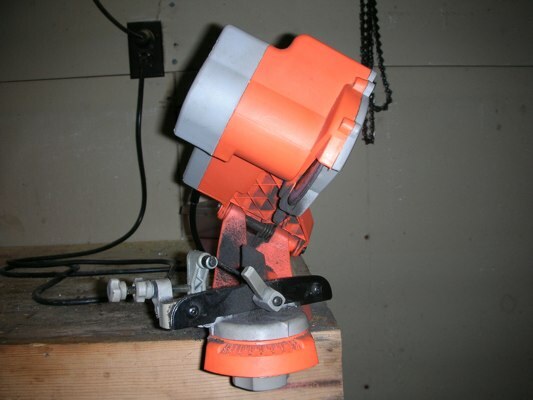 Chicago Chainsaw Sharpener Review - Should You Buy One? Here it is, our Chicago chainsaw sharpener review! 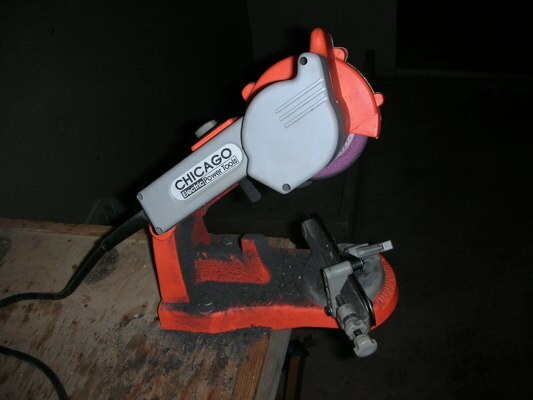 I bought the Chicago electric chainsaw sharpener about 5 years ago. What do I think? Money well spent! Before purchasing the sharpener I would take 2 or 3 chains up to our local hardware store and have them sharpened for 4 dollars apiece. The hardware store did a great job, but why pay them 4 dollars each time when I could just go buy my own sharpener? In the past I have used Oregon electric chainsaw sharpeners and have been very pleased. The only downfall is the price. At the time I wasn't sure I was ready to spend a lot of money on an electric sharpener. After a little research I decided to purchase the Chicago electric chainsaw sharpener. I bought the sharpener from Harbor Freight on sale for around $40. When I received the sharpener I was pretty excited. The thought of being able to sharpen a chain without running up to the hardware store sounded great. Plus, I figured after a few times the sharpener would pay for itself. I mounted the sharpener on my work bench and read the included instruction manuel. After a small learning curve and "getting the hang of it" I was sharpening chains that were as sharp as the ones from the hardware store! I didn't clean the machine in these pictures. The black dust is left behind from the sharpening process. Lots of dust......lots of sharpened chains and the machine is still running strong. The most appealing thing about the Chicago electric sharpener is the price. For around $40 it's hard to pass up. 10 sharpening's and the equipment pays for itself. I also like the convenience of being able to sharpen a chain at a consistent angle every time. I've tried to sharpen a chain by hand more than once. Each time has the same outcome......not good. Hand sharpening a chain is definitely a talent I don't have. The sharpener has plenty of power to quickly sharpen the chain. After all, you're not supposed to be grinding away a lot of chain....only a little to make it sharp. The Chicago sharpener has easy to read markings that allow you to quickly set the grinding degree of the sharpener. I usually set the angle to 30 degrees and it takes about 3-5 minutes for me to sharpen a chain. Although this is just a guess, I'd say I've sharpened around 100 chains with my sharpener. My neighbors, family members and friends all drop off a chain every once in a while to get it sharpened. My dad liked the sharpener so much he went out and bought one for himself! Probably the best thing about the sharpener is that with a steady hand, the sharpener is easy for anyone to use. I can't say there is anything I absolutely hate about the sharpener, but here are a few flaws or areas that could be improved. There is quite a bit of "play" in the grinding wheel arm. Without a steady hand, you can actually change the downward grinding angle. A little awareness and a steady hand will cure this. I usually use 2 0r 3 fingers and a light touch to let the machine do the work. I've read other reviews where people have added their own bushings to the sharpener to help reduce the amount of side to side play. For the average person, the small amount of movement shouldn't effect your chain. The chain stop on the guide also seems to be a little off center. Again, not a big deal, but it's a flaw you wouldn't find on the better, more expensive sharpeners. Overall, I am very pleased with the Chicago electric chainsaw sharpener. This sharpener is a tool that I use quite a bit. It has always performed well and I would recommend this sharpener to anyone who is looking for a low cost, consistent way to sharpen you own chainsaw chains.